Taking the space of a former auto parts service center, Hopstix’s interior summons a sense of Japanese simplicity — airy with exposed ceilings, browns and grays, lots of wood, sleek concrete floors, an enormous wooden barn door that separates the dining room from the barrel room. The focal point is a vast open kitchen with counter seating. Behind it, parted by glass, are gleaming rows of fermentation tanks. There are a few different themes going on at Hopstix, and surprisingly, they fit together quite seamlessly. Executive chef Dony Raymond's menu is broken into several sections, all encouraging sharing. Mix things up with a starter, a couple of sticks from the robata grill, a few selections from the raw bar, sushi rolls, and perhaps an entrée. The Super Bowl ($16) has a little bit of everything: a tall black vessel filled with sushi rice, micro greens, cool cubes of sashimi, sea eel in an unctuous tare sauce, nori, avocado, robata grilled pork belly, and an oozy quail egg. The dinner version of the entrée differs slightly but each offers a different bite every time the chopsticks dive in. Tuna tartare ($12) is a visually stunning and flavor-packed plate of chopped raw tuna mixed with pine nuts and Asian pear, topped with a tiny quail egg yolk. Slivers of avocado accompany it, as does a small green salad. A kooky yet flavorsome choice is the sushi corndog ($10) which is neither corn nor dog. Instead, it’s a lightly beer-battered spicy tuna roll on a stick with a drizzle of spicy mayo. Strange, but it works. No value assignedAll of the raw bar premium selections ($14-$15) are well done. Three way oysters come with three different toppings: monkfish liver, torched sea urchin and salmon roe. Oysters are fresh and selections change often. Maidai tataki are lightly torched bites of snapper gathered around a pool of ponzu, a perfect dressing for the micro greens that complement most dishes. Don’t treat them like garnish. Think of the pretty mounds as salad, and eat up! Skewers from the robata are plentiful, especially for the $2-$3 price. Even the chicken breast has a crisp barbecued sear, adding a touch of smoke to the tender meat. A stick of silky pork belly from a North Carolina heritage breed is just that: silky, the meat slightly sweet with marbling that melts. There are premium cuts like Wagyu ($7) and live scallop ($12) but the sweet spot is that silky pork. Fish from the raw bar is sold by the ounce, in homage to the trips Tan took to visit his aunt in Tokyo. “We walked to the fish market to choose by gram of this and that to take home and enjoy,” he recalls. “Fresh and easy.” Serving poke style, with fish cut into cubes, is quicker and more affordable than making sashimi, which takes time and precision. Fish and prices change seasonally and according to what comes in fresh. At the time of this writing, prices were $3-$6 per ounce (think of an ounce as an ice cream scoop of cubes). 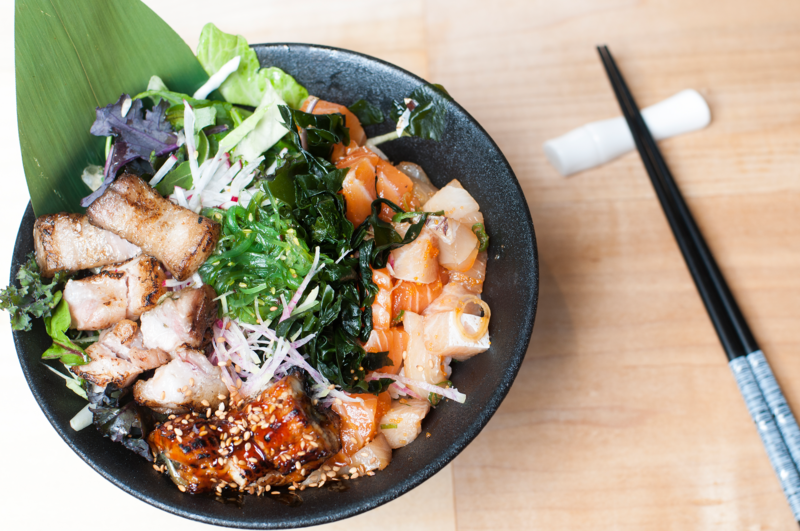 Add sushi rice, pickled ginger, or other fixings to create a bowl.